At the start of the Bumblebee Program the largest existing solid rockets carried payloads much smaller than the new missiles that were being designed. In 1945 few rockets could accelerate loads greater than 100 pounds to supersonic speeds and all had a range of only a few miles. The initial Bumblebee goal was to launch a 1000 pound missile to a velocity of twice the speed of sound (Mach 2) in about two seconds. The final Talos missile weighed 3360 pounds and was boosted to Mach 2.2 in about 5 seconds to a range of about eight miles. The production of the 4360 pound Mk 11 Talos booster required development of entirely new technologies. The lessons learned from Talos led the way to development of very large solid rockets such as the boosters for the space shuttle. 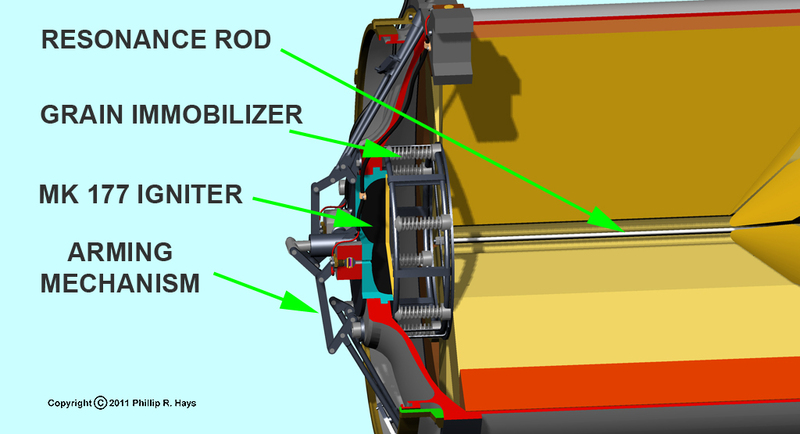 The figure shows several structures for the propellant grain in solid rockets, viewed from the nozzle end. Propellant is yellow, the rocket tube is black, and the red outline shows the burning surface along the length of the grain. The simplest form is just a tube filled completely with fuel as shown at the upper left. The burning surface starts at the rear end of the propellant grain and moves forward as the fuel is consumed. This arrangement is easy to build and has the advantage that the burning surface area remains constant as the fuel burns, producing a constant thrust. However, the burning surface area is relatively small, producing a limited amount of hot gasses. Thrust is proportional to the momentum of the gasses escaping the nozzle, and this is dependent upon the amount of gasses being produced, so this simple form produces relatively low thrust. The solution to low thrust was to increase the burning surface area by allowing the grain to burn along the sides as well as from the end. For example, if the cylindrical grain was smaller diameter than the inside of the tube, as shown top center, the propellant could burn down the full length, greatly increasing the burning area. However, this configuration produces maximum thrust immediately after ignition. As the propellant burns inward the surface area decreases, producing less combustion gasses, and thrust falls off. This is a problem where a constant sustained thrust is needed, as in a missile booster. Hollow cylindrical grains, as shown at upper right, produce a fairly constant thrust. As the outside surface burns the surface area decreases, but the burning area increases as the inside surface burns. The result is a more or less constant burning area. The problem with this design is that the propellant tube is supported at only a few places, ideally at the front end. The tube loses strength as it burns thinner and thinner, and it eventually can no longer support itself. If a large part breaks off and plugs the nozzle the rocket explodes. More complex grain shapes are used to generate constant thrust. 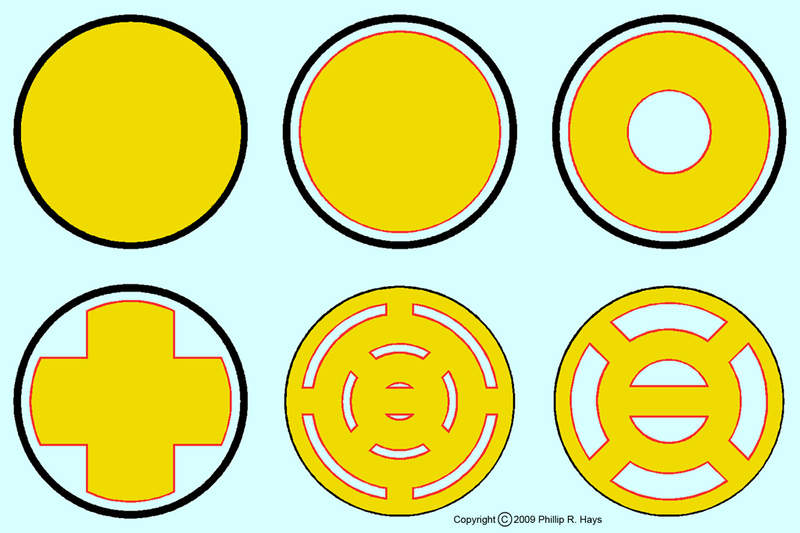 The "+" or cruciform shaped grain shown bottom left is similar to what was used in the "Holy Moses" High Velocity Aircraft Rockets (HVAR) launched from airplanes in WWII. These same rockets were used to boost the early Bumblebee ramjet burner test vehicles. As burning proceeds inward the burning area increases along the edges of each "V" while the area diminishes on the outside curved surface. This configuration produces relatively constant thrust and is stronger than the hollow cylinder. A problem with these first four designs is that the shell of the rocket is exposed to the hot exhaust gasses, so the casing must be made of high temperature materials and be strong enough to contain the pressures in the motor. This increases weight, an undesirable feature in booster rockets. The lower center and right grain structures solve these problems. They combine the cruciform and cylindrical forms. The patterns shown are similar to early experimental rocket grains used in the Bumblebee Program. Burning takes place in the cavities in the grain, with the exhaust gasses passing through the cavities to escape at the rear. 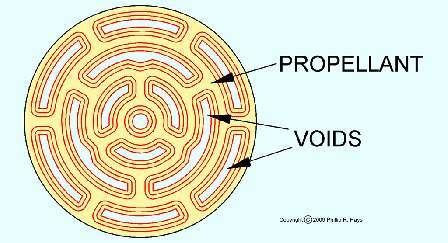 On the inside surface (shorter radius) of the cavities as burning moves inward the burning surface grows smaller. But on the outside surfaces (longer radius) of the cavities the burning surface increases in area. With careful design the burning area remains constant until the propellant is almost consumed, providing a constant thrust. The supporting radial struts are thick enough that they do not burn away until the inner cylindrical masses are consumed. The propellant around the inside of the casing insulates the shell from exhaust temperatures so the case can be made thinner and lighter weight, and can be of low melting temperature materials. In addition, the propellant grain can be cast in the tubular casing. A problem with these designs is that the thinner parts of the grain have lower mechanical strength. The high pressures inside the grain can cause it to crack, exposing more surface for burning. If the grain cracks the increase in burning surface may cause a sudden increase in pressure that can cause the rocket to explode. A propellant material that possessed high mechanical strength and was resistant to cracking was needed. Programs to develop booster rockets were begun at Aerojet Engineering Corporation and at the Allegheny Ballistics Laboratory. The first project was to develop a booster for an 18 inch diameter ramjet test vehicle (RTV). Aerojet was producing jet-assisted takeoff (JATO) rockets for launching aircraft from short runways. These used a blend of asphalt and potassium perchlorate that was easy to cast, but the specific impulse was too low. A similar mixture of ammonium perchlorate in a polymeric resin was developed that had sufficient specific impulse and was easy to work with. Allegheny Ballistics Laboratory drew upon its experience with the smokeless powders used for artillery propellants, and explored ways to cast them in large single grains. The propellant that was developed was a modified nitrocellulose powder (guncotton) in a solvent of 75% nitroglycerine, 24% plasticizer (triacetin) and 1% stabilizer (2-nitrodipnenylamine). This type of propellant is called a "double base" because it has two explosive compounds that contribute to the thrust, nitrocellulose and nitroglycerine. The propellant was also about 9% heavy metal compounds, usually lead stearate.1, 2 This made the propellant burning rate relatively independent of ambient temperature. It was very desirable to have minimum variations in rocket thrust over a wide operating temperature range. Missiles were stored in air conditioned magazines but might be loaded onto the launcher in equatorial heat or arctic cold, so insensitivity to ambient temperature was another goal in booster development. Development of the new booster was completed in 1947. Five static and five launch tests with a dummy BTV were all successful. Telemetry indicated that the propellant grain withstood the forces of acceleration and vibration without grain breakup. The booster performed correctly in the first BTV test flight in August 1947. In January 1948 work began to produce a larger version of the booster for the experimental prototype missile (XPM), the prototype Talos missile. The first flight of the new booster was in July 1948, with a dummy load. The booster weighed 3000 pounds and burned for 3.5 seconds, delivering 90,000 pounds of thrust. The first flight of the booster and the new XPM airframe was in December 1948. 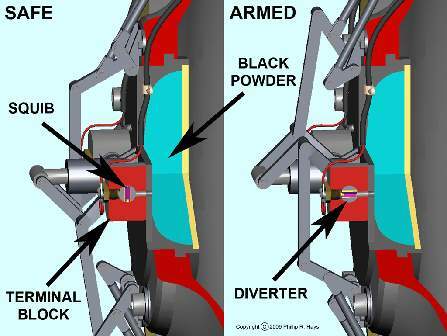 The booster handling features were redesigned to be symmetrical to eliminate the problem. The rocket engine performed as expected in the first two tests, so a third flight test was carried out in March, 1949, without missile wings, and this produced satisfactory performance of the booster and the new ramjet engine. After rework of the missile and booster fins and wings a flight test in March 1950 was successful. In early 1949 the XPM design was revised, requiring a still larger booster. By then the techniques for producing the parts of the rocket had been perfected to the point it was easy to create a new design to meet the changing requirements. In June, 1949, a new booster was tested that weighed 3720 pounds and produced 105,000 pounds of thrust. It carried 2063 pounds of propellant. However, the prototype missile design was changed again, requiring an even larger booster with reduced case weight. The redesign was done in 1950 and 1951. The prototype Talos XSAM-N-6 booster used a perforated grain pattern that was a follow-on of the XPM booster grain. It used the same propellant composition as the XPM boosters, with a larger quantity of propellant that burned for four seconds and produced 95,000 pounds of thrust. 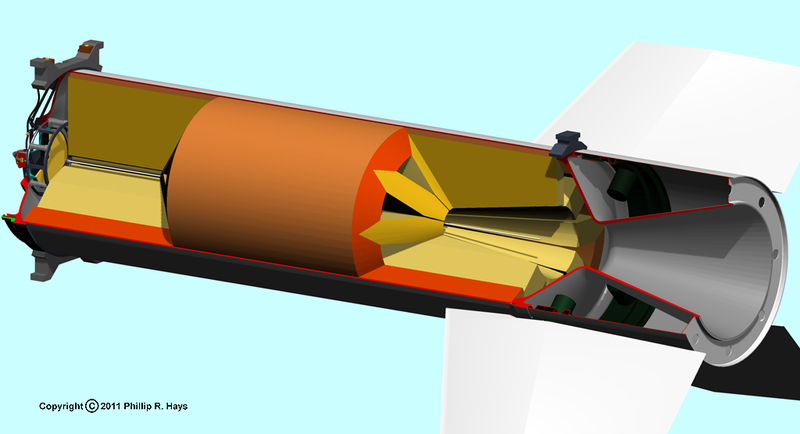 The booster configuration shown in this cutaway picture is based upon the patent for the original XSAM-N-6 design.2 I have cut away part of the yellow propellant grain to show the combustion channels inside the grain. The propellant was cast into a thin fire retarding cellulose acetate tube (not shown) that prevented burning from passing through to the outer metal shell. At the front end were the arming mechanism and the igniter. A spring loaded Grain Immobilizer Assembly between the head end cap and the propellant grain forced the grain tightly against a shoulder machined in the booster nozzle. 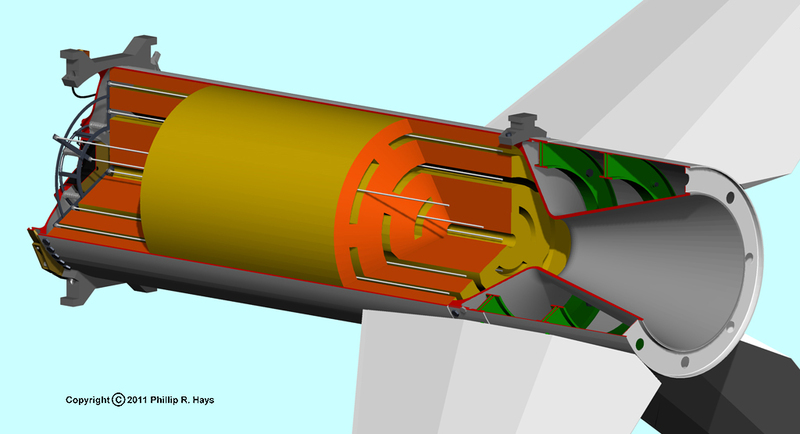 A cross-section of the booster grain is shown at right. It was composed of three cylindrical sections supported by radial struts inside an outer cylindrical section that was bonded to the casing. In each void burning started at the innermost red line. As burning progressed, shown by the second and third red lines around each void, the total burning surface of each cylindrical section remained almost constant. The thickness of the struts and the outermost cylinder were calculated to ensure they did not burn away until all of the inner material was consumed. The entire mass of fuel was burned before hot gasses reached the shell. Although the grain was carefully designed to produce constant thrust throughout the burning period this did not always happen. The booster occasionally produced high thrust pulses. If this happened just after missile-booster separation the booster drove ahead and crashed into the rear of the missile, choking off airflow through the ramjet and sometimes causing severe damage. This uneven burning was called secondary flame, resonant burning or "chuffing" 2, 6, 13 and finding a solution was another problem that had to be solved. One cause was determined to be incomplete or uneven ignition of the propellant that resulted in irregular flash burning on the propellant surface. This resulted in the release of unburned combustible gasses, principally hydrogen and carbon monoxide.6, 10 These gasses ignited sporadically inside the cavities, causing extreme pressure variations that produced uneven thrust and could crack the grain, causing destruction of the missile. Several approaches were tried to suppress this problem.4, 12 The solution was installation of small diameter steel resonance rods in the cavities in the grain. These are the narrow white rods shown in the cutaway drawing. The rods were coated with a flame-retardant material such as an ethyl-cellulose binder containing potassium sulfate that vaporized in the hot exhaust gasses and prevented them from re-igniting.6, 9 In essence, the material acted as a fire extinguisher. In addition, the rods absorbed resonant energy in the combustion gasses and stabilized burning. The early prototype booster had a fairly simple arming mechanism.13 In the center of the front end of the case was an igniter filled with black powder with several pyrotechnic squibs embedded in the powder. 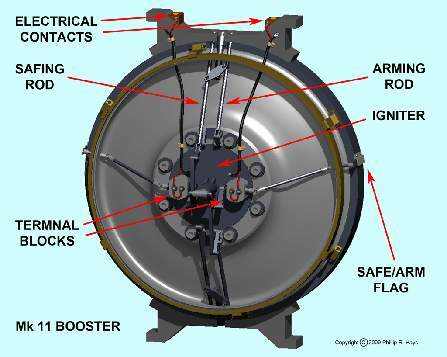 The electrical firing circuit in the launcher connected to the booster through a contact on one of the front launching rail shoes. The circuit passed through the normally open contact in a single pole double throw safing switch and then to the squibs. When disarmed the circuit from the squibs passed through the normally closed contact of the switch to the casing of the booster, shorting the circuit to the squibs to prevent accidental firing. A mechanism at the bottom front had a gear that engaged teeth on a rotating ring around the igniter. When the mechanism was rotated the ring turned to cause an arm on the ring to depress the safing switch. When this switch closed the circuit from the shoe contact to the squibs was completed and the booster was armed and ready for launch. The firing current from the launcher passed through the switch and ignited the squibs. 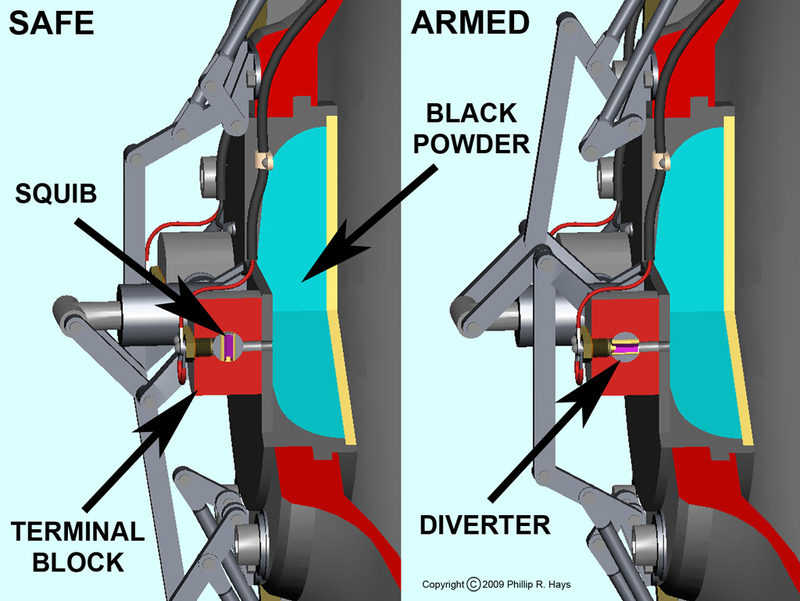 When the black powder ignited it burst the thin rear plate on the igniter and flooded the propellant cavities with fire. Flame from the igniter passed through the combustion channels in the grain, igniting the propellant, then out the back end of the grain and through the nozzle. This mechanism was suitable for the protype test missiles, but was unsuitable for shipboard use. The booster had to be armed manually from below, and the firing circuit was not redundant. The missile and booster were held together by a clamp ring attached to the front of the booster. This ring fit over matching surfaces on the missile and booster, holding them together. 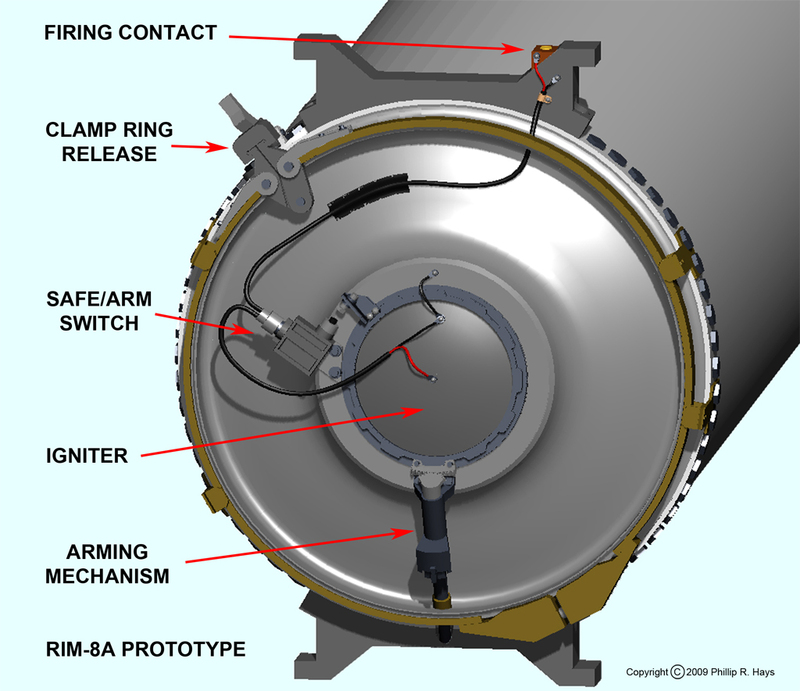 The prototype missile had a mechanical clamp ring release that was activated when the arm on the release mechanism struck a lug that projected from the launcher. This released the clamp ring at the beginning of the boost phase. The missile and booster were held together only by the force of the booster pushing against the missile. The first Talos missile was launched on October 28, 1952. The missile weighed 3030 pounds and the booster weighed 4425 pounds. Talos booster development was essentially finished, but a few modifications were made to accommodate the changes in missile design in the subsequent years.13 The booster contained 2803 pounds of propellant that burned for 5.4 seconds producing 109,800 pounds average thrust. The original Mk 11 Mod 0 booster was soon replaced by the Mod 1 and Mod 2 versions. Changes included a thinner shell to reduce weight, modification to the igniter arming mechanism and a pneumatic mechanism for the release of the booster clamp ring. The Mk 11 Mod 0 booster for the RIM-8A First Tactical Talos contained a new star-shaped grain pattern. The small central void expanded conically to a wider opening near the aft end of the grain. Another change was the use of two double base propellants, type ARP (pale orange) around the outside of the grain and type AHH (pale yellow) in the projecting points. The AHH and ARP propellants were similar to the propellant used in earlier boosters, with modified nitrocellulose powders in a solvent of 75% nitroglycerine, 24% plasticizer (triacetin) and 1% stabilizer (2-nitrodipnenylamine) The nitrocellulose components contained additives to control the burn rates so the AAH points burned completely before the ARP burned through to the shell. Again, burning started in the voids. 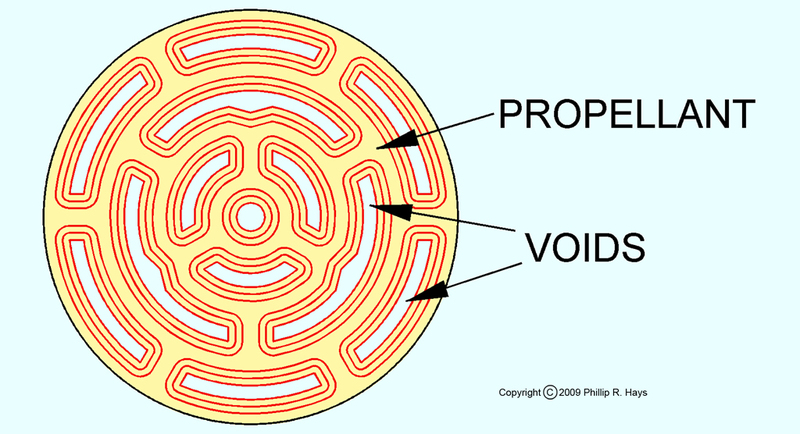 The surface area of the projection points decreased while the surface area of the voids increased as the propellant burned, producing a constant burning area and thrust. This booster contained one resonance rod down the center of the grain. A spring loaded Grain Immobilizer Assembly between the head end cap and the propellant grain forced the grain tightly against a shoulder machined in the booster nozzle. The Mk 11 boosters had two separate firing circuits with a launcher contact on each launching rail lug.5 The wires passed directly to two terminal blocks mounted on the MK 177 igniter, each with two firing squibs. Inside the blocks the squibs were mounted in rotating cylinders called squib diverters. When the booster was in the safe condition the diverters were rotated so the squibs had no connection to the firing circuit and there was no passage from the squibs to the black powder in the igniter. A mechanical linkage rotated the diverters 90° to bring the squibs into contact with the electrical firing circuit and position them over openings into the black powder cavity. The linkage was operated by push rods at the top and bottom of the booster front end, one pair to arm the booster and another pair to put it in the safe state. To arm the booster a plunger extended from the launcher and pushed the arming rod. A linkage caused the mechanism to rotate the diverters to bring the squibs into firing position. When the diverters rotated they activated a mechanism that displayed a flag at the side of the booster to signal that the booster was armed. To disarm the missile another plunger in the launcher extended to push the safing rod. This caused the diverter to rotate back into the position where there was no electrical contact with the squibs and no passage from the squibs to the black powder. Spring loaded contacts in the terminal blocks made electrical connection with the squibs when the mechanism was armed. When the pyrotechnic charge in the squib fired a flame passed through holes in the igniter case to the black powder charge, igniting it. 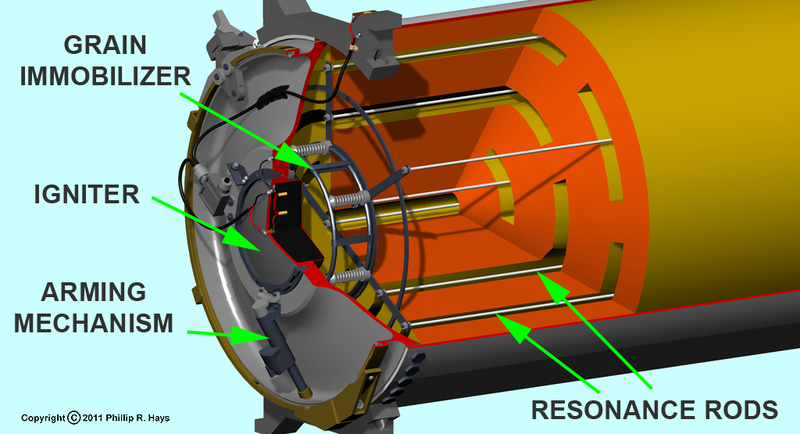 The two independent firing circuits made the booster more reliable. The mechanical method of isolating the squibs from the black powder made the boosters safer to handle. Even if a squib accidentally fired in the safe position there was no access from the squib to the igniter charge. The early production boosters had an explosive bolt clamp ring release mechanism. When booster acceleration stopped the bolt was fired to open the clamp ring. This ensured the missile and booster would remain together through the boost phase. Later versions used a pneumatic release that was triggered by a drop in internal booster chamber pressure at the end of propellant burning. The booster was redesigned for the Extended Range Talos (RIM-8C) to create the Mk 11 Mod 2 that was lighter weight and produced more thrust for the heavier missile. The final booster design weighed 4278 pounds. It burned for 5.4 seconds, producing 596,000 pound-seconds impulse (109,800 pounds thrust). The internal chamber pressure was a fairly constant 1000 psia. throughout the boost phase.11 The booster accelerated the Talos missile to over 2000 feet per second (1360 mph). 1. Casting Solvents for OIO, OGK and AHH Propellants, Army-PA, MIL-C-13609B(PA), 25 Nov 1974. 2. Guided Missile, Walter H. Goss, Henry H. Porter, Richard B. Roberts, Merle Antony Tuve, Jesse W. Beams, and Harner Selvidge, U. S. Patent No. 3908933, September 30, 1975. 4. Method for Suppressing Rocket Motor Exhaust Flame, Richard A. Breitengross, Jr. and William E. Donaldson, U. S. Patent No. 3166896, January 26, 1965. 5. Missile Booster Arming Device, Serge N. Samburoff and Arthur H. Miller, U. S. Patent No. 2954733, October 4, 1960. 6. Rocket With Internal Rod, Albert T. Camp, U. S. Patent No. 3068643, December 18, 1962. 7. Solid Propellant Charge for Rocket Motors, Peter Mueller Schulter, U. S. Patent No. 3260208, July 12, 1966. 8. Solid Propellant Grain Design and Internal Ballistics, Howard W. Douglass et.al, NASA Space Vehicle Design Criteria (Chemical Propulsion) Monograph SP-8076, 1972. 9. 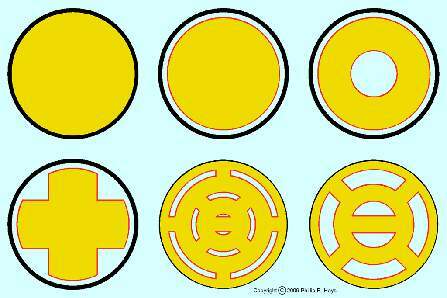 Solid Propellant Rocket Motor Resonance Suppression Rings, John C, Horvath, U. S. Patent No. 3,327,481, June 27, 1967. 10. Some Experiments Related to L-Star Instability in Rocket Motors, R. N. Kumar and R. P. McNamara, Guggenheim Jet Propulsion Center, Pasadena, California, AIAA/SAE 9th Propulsion Conference, Las Vegas, Nevada, November 5-7, 1973. 11. Spirit II Vehicle (A26.780) Final Post Flight Report, C. P. Chalfant, Phillips Laboratory, Air Force Systems Command, May 26, 1992. 12. Suppression of Unstable Burning Using Finely Divided Metal Oxides, Ralph W. Lawrence and Albert J. Secchi, U. S. Patent No. 3822154, July 2 1974. 13. The Talos Booster Rockets, William H. Avery, Johns Hopkins APL Technical Digest Vol. 3, No. 2, 1982, page 135. 14. The Unified Talos, Frank A. Dean, Johns Hopkins APL Technical Digest Vol. 3, No. 2, 1982, page 123. 15. Wind-Tunnel Investigation of a 1/6-Scale Model of the Bumblebee XPM Missile at High Subsonic Speeds, Warren H. Nelson, National Advisory Committee for Aeronautics, NACA RM A50I11, December 11, 1950. What is the origin of the term "head?" Thanks to Gerald Snyder for information about the Mk 11 booster.